ICTUSnet is divided in 5 technical WPs and 3 transversal WPs for coordination. They are leaded by 6 consortium partners. WP1 (Leader: AQuAS): implementation of decentralized stroke registries at the regional/institutional level – or the improvement of existing ones – and design and development of the ICTUSnet platform for the analysis of shared information, the exchange of knowledge and good practices. WP2 (Leader: BSC): development of an interoperable text mining system for extracting multilingual information using cognitive computing technologies, to process the clinical reports of stroke cases at the hospitals of the network. Additionally, advanced machine learning techniques will be applied also to radiological images to foster automated analysis. WP3 (Leader: IACS): analysis and comparison of the different regional stroke care models, along all stages of the continuum of care (prevention, acute care and rehabilitation). An evaluation framework will be defined and process mining techniques will be applied to identify best practices, using different data sources from the regions. 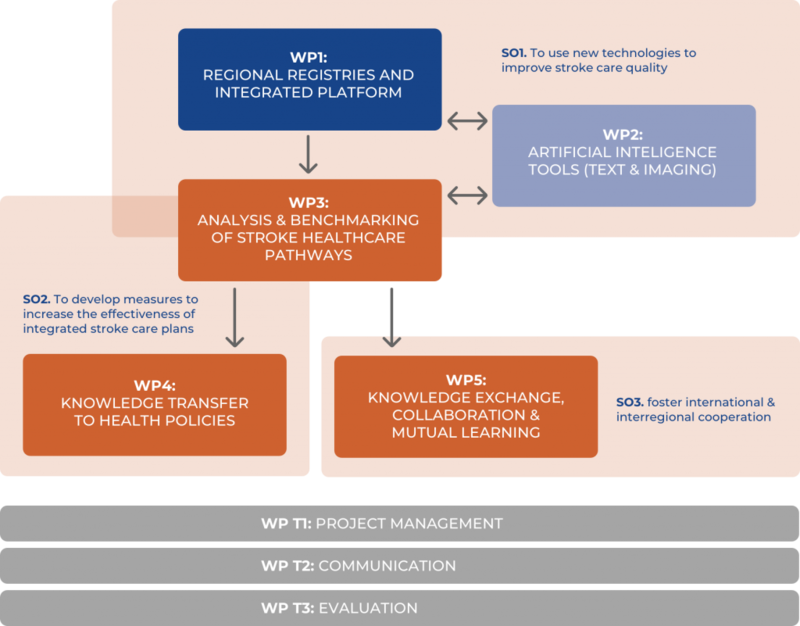 WP4 (Leader: ARSN): transfer of the acquired knowledge to all relevant decision-making stakeholders, proposing a co-creation process to develop an action plan and recommendations to improve the efficiency, inequity and quality of stroke care services. WP5 (Leader: CHUT): design and implementation of a training program, thematic workshops and working groups as part of activities to promote international cooperation and mutual learning, and the exchange of good practices and lessons learned. Transversal WPs: set of 3 WPs focussed on the management and sustainabilityof the project, including WP T1 (AQuAS) – project monitoring and governance; WP T2 (OE) – project dissemination and exploitation; and, WP T3 (AQuAS) – Quality assurance and evaluation.